Cellular redox status presents broad implications with diverse physiological and pathological processes. Simultaneous detection of both the oxidative and reductive species of redox couples, especially the most representative pair glutathione/hydrogen peroxide (GSH/H2O2), is crucial to accurately map the cellular redox status. However, it still remains challenging to synchronously detect GSH/H2O2in vivo due to lack of a reliable measuring tool. Herein, a ratiometric nanoprobe (UCNP-TB) possessing simultaneous delectability of GSH/H2O2 is established based on a multi-spectral upconverting nanophosphor (UCNP-OA) as the luminescence resonance energy transfer (LRET) donor and two dye molecules as the acceptors, including a GSH-sensitive dye (TCG) and a H2O2-sensitive dye (BCH). With the as-prepared UCNP-TB, real-time and synchronous monitoring the variation of GSH and H2O2in vitro and in living mice can be achieved using the ratio of the upconversion luminescence (UCL) at 540 and 650 nm to that at 800 nm as the detection signal, respectively, providing highly inherent reliability of the sensing results by self-calibration. 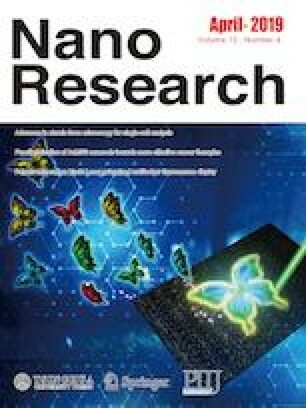 Moreover, the nanoprobe is capable of mapping the redox status within the drug-resistant tumor and the drug-induced hepatotoxic liver via ratiometric UCL imaging. Thus, this nanoprobe would provide a reliable tool to elucidate the redox state in vivo. Supplementary material (the 1H NMR spectra, ESI-MS, DLS, TEM, and FTIR characterization et al.) is available in the online version of this article at https://doi.org/10.1007/s12274-019-2327-6. This research was supported by the National Natural Science Foundation of China (Nos. 21771065 and 81630046), the Natural Science Foundation of Guangdong Province, China (No. 2017A020215088), the Science and Technology Planning Project of Guangdong Province, China (Nos. 2015B020233016 and 2014B020215003), the Science and Technology Planning Project of Guangdong Province (Guangdong-Hong Kong Joint Innovation Project), China (No. 2014B050504009) Pearl River Nova Program of Guangzhou, Guangdong Province, China (No. 201806010189), and the Scientific and Technological Planning Project of Guangzhou, Guangdong Province, China (No. 201805010002).